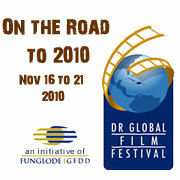 We can say it loud and clear: the next edition of the Dominican Republic Global Film Festival will be held on November 16 to 21, 2010. All of the wheels were already in motion just hours after the closure of the current, and third, Festival. The staff is already thinking and planning for the Festival. The fourth film festival will be reinforced by the experience gathered at the first three successful events. The same high quality films, national and international guests, experts to give workshops, presentations and offer informative panels will be on hand. It is clear that the participants as well as the public enjoy and view these panels and workshops as invaluable tools of the trade. This great festival will remain faithful to the standards of the previous three and will continue with the important slogan that has echoed throughout the international film circuit: Global Issues, Personal Stories. Just looking at the titles of a vast majority of participating films each year, it is easy to see that this slogan expresses the spirit of the Festival and more. Showing films around the country in various venues has proved successful and will continue. It is no surprise that the festival team dedicates so many months working in preparation for the event. They spend time tracking down films for the program and that often takes them around the world to see what is happening in other festivals. The Festival staff is already hard at work in the multiple areas that require multidisciplinary effort in a film festival of this size and importance: technical direction; programming; production; relations with filmmakers; promotion and marketing; communication, publications, digital media and publicity; webmaster; webcasting; technological infrastructure; graphic design and photography. Then there are the professional panels; thematic panels; translation; coordination of volunteers; administration; special events; ticket sales; relations with universities and corporations; transportation; special services; coordination in the provinces and security. In this sense, the Festival – an initiative of the Fundación Global Democracia y Desarrollo (FUNGLODE) and the Global Foundation for Democracy and Development (GFDD) – will bring together the best in international film to Dominican soil while offering learning opportunities, professional training and the creation of networks for the public as well as film industry professionals.